The involvement of corporates and fossil fuel lobby groups in the United Nations Framework Convention on Climate Change (UNFCCC) is not new. From the very first Conference of the Parties (COP) to COP21 in Paris, we have seen them take every action to jeopardize a universal climate agreement and to ensure no harm comes to the fossil fuels industry. The conflict between climate change policy and the fossil fuel industry has to be acknowledged. Negotiations to bring countries on the same page in solving the climate crisis have been going on for 20 years through COP. Until COP21, the closest we came to an agreement was during COP3 and COP15. The significant lobbying and failure of 20 COPs are the reason of our present climate suffering. This July marked the hottest ever recorded month that the earth has ever endured, and the preceding 14 months also witnessed record-breaking heat. Since 1988, more than half of all industrial carbon emissions have been released since the industrial revolution, increasing the prospect of irreversible climate change. The fossil fuels industry has been aware of the deleterious effects of such emissions on the environment since the 1980s but has continued to fund deniers nonetheless. To them, profit matters more than the environment and growth is the ultimate goal, never mind if earth as we know it is destroyed in the bargain. Their concessions to climate action are paltry in the face of what is actually required. Carbon tax, in this context, is another loophole, which shifts focus from emission reduction to emission transfer. So, why are corporations even allowed to influence such negotiations? Back in the 1970s, the United Nations (UN) took up an initiative to monitor big companies so that they can't create pressure on developing nations for business. With time, the UN changed that policy and the companies were given priority to invest in the name of foreign direct investment through the UN. Later in the 90s, the financial crisis within the UN opened doors for more corporate-UN partnerships. 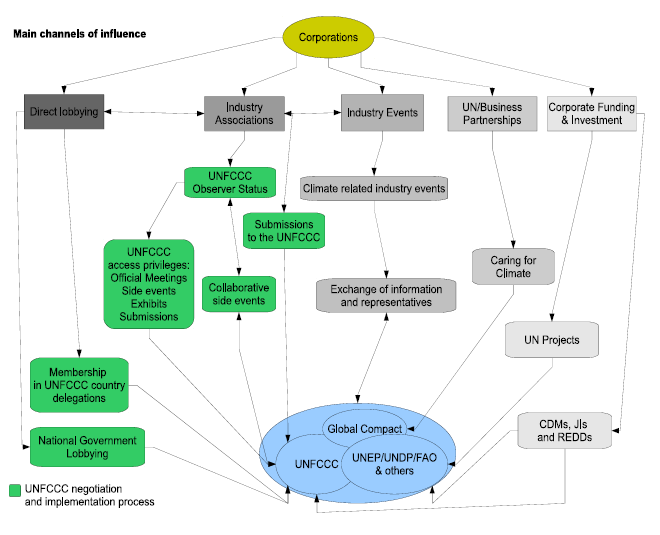 The UNFCCC is just one part of it. The Paris agreement holds the countries accountable to lower carbon emissions by their voluntary commitment and leaves corporations out of any legal binding to take climate action. And there's no mention of the phrase "fossil fuels" anywhere in the agreement. Thus, industry leads saw no impact whatsoever on business. And, fossil fuel subsidies continue to thrive. How compatible is the handing out of money to the fossil fuel industry with the Paris Agreement? So far, 27 countries, accounting for 39.08% of global GHG emissions, have ratified the Paris agreement. At this juncture it might be useful to look at the journey of tobacco companies, which are among the world's most sophisticated and successful marketers. They spend billions of dollars to promote their toxic products, prevent governments from protecting their people and mislead tobacco users about the impact of their products on health. Much as the fossil fuel industry is doing, the tobacco lobby denied the relationship between smoking and disease. Then in the 1990s, it came out that companies had been aware of the harmful effects of smoking since the mid-1950s. Then they laid out a strategy to hide this information to undermine the growing evidence. We must ensure that the big polluters are kept out of our negotiation rooms. It took decades to get a universal control on the tobacco industry. But, once the tobacco industry was not allowed to intervene, a remarkable turnaround occurred, leading to one of the most quickly accepted treaties in UN history and the first agreement under the World Health Organization (WHO). The Framework Convention on Tobacco Control (FCTC) came into force in 2005. Parties to the FCTC agreed that there is a fundamental and irreconcilable conflict between tobacco industry interests and public health policy. The FCTC even obligates parties to protect public health policies from commercial and other vested interests of the tobacco industry. It provides governments with the support of the international community to stand up to interference from the tobacco industry. COP21 has given us an agreement, but it could not stay out of the grip of the fossil fuel industry. Tellingly, as much as 20% of the sponsorship of the Paris climate summit came from polluting companies. As history testifies, companies will work for their interest rather than the greater good, even if means keeping the world in the dark. The conflict between climate change policy and the fossil fuel industry has to be acknowledged. Time is a luxury that we do not have in the fight against climate change, and we must ensure that the big polluters are kept out of our negotiation rooms.